IMO Free Video Calls and Text App Review. Although there are plenty of applications available for the need of free video calls and text, SKYPE is one of the best among all the available apps. Actually, SKYPE is the oldest (launched in 2003, by Microsoft Corporation) in this category, and is available for almost every of the platform, and for this reason it holds the big fan following against his name. To tell you the truth, we are also a great fan of SKYPE, and using it from many past years. As we has used it for a long period of time, we found many technical problems while using it. One of the main problem using SKYPE is the “signing in” problem, there were times, when we had attempted for 10-15 times, in a single session, to get inside. Due to this reason, from the last few days, we were in the search for any better alternative for SKYPE. Few days back, one of the staff member from our group, suggested us to have a try to this new IMO Free Video Calls and Text App. At that moment, as we had never heard about this IMO app, taken it lightly. Yesterday, the same staff member, remind us again about the IMO app, this time we thought about giving a try at least to the IMO app. We downloaded the IMO app and was really impressed with its first look in the Android Phone. Later, we were more impressed by the features offered inside the app. After using it for a complete day, we haven’t found any nag inside the IMO app. Due to this reason, Today we have decided to share the strong points about this great IMO Free Video Calls and Text App with the Internet Community, as sharing is caring. Now a days, Internet is full of paid reviews. Please, never-ever think the same for these views too. Till date, we are not connected to any affiliate marketing system or program. This is just our personal views about the IMO Free Video Calls and Text App. Just give it a try, If agreed with our views, keep it in your device OTHERWISE throw it out to the dustbin 🙂 . So, can we start the main section now, IMO app review, let’s start with the account creating in IMO app. How to Create a New Account using IMO app. As of now, IMO is only available for the Android and iOS platform. You can easily download it by going the Google play store (Android users) and the Apple itunes (iOS users). We hope everybody now a days is fully familiar about downloading and installing any app from their respective stores, and don’t need the explanations for the same 🙂 . Below are the complete easy steps about creating the new account with IMO app. 1)- Open IMO app in your phone / device. 2)- It will ask you to provide your phone / mobile number. Supply the number in the box. 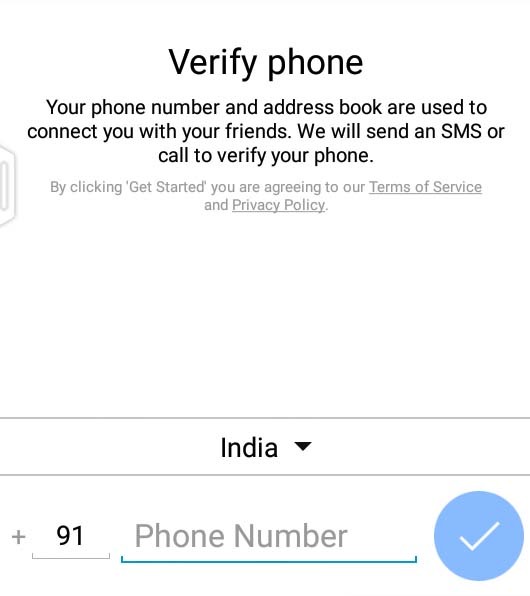 3)- Now, to verify the given phone / mobile number, IMO app will send you a 4 digit OTP (One Time Password) on the provided phone number. Once you get the OTP SMS, in majority of the cases, it will verify the OTP itself from the SMS inbox. If it fails, you have to supply this 4 digit OTP manually at the provided screen inside the IMO. 4)- After the verification process, it will ask you about your Name and Age, provide the same to the IMO app. Note: It may ask, your gender, date of birth, picture etc, don’t hesitate to provide the same to IMO app. 5)- Congo!, You have successfully registered with the IMO app, Enjoy calling your friends. Important: IMO will never ask you about your email identity or address, here the phone number is the username as well as the password. The whole process of the new account creation just takes 2-3 minutes, don’t you think it’s easy too 🙂 . Important Features of IMO Free Video Calls and Text App. Although, the IMO app is full of features here and there, below are some important one’s in detail. Don’t miss out any of them as they all will help you to make any honest decision about the IMO app. In this modern world, where every mobile app of this category is near about 30-40 MB, can you believe, this IMO app is just under 6 MB, actually it’s of 5.4 MB. Even after the installation, it only consumes near about 19 MB of the space in the internal storage of the phone. In addition to its small size, it’s less dependent on the cached files. By this we mean, it creates the minimum cached files while performing its operations, which in return is good for the performance of the device / phone. Other apps from the same category, are highly dependent on the big cache files they create, which effect the performance of the device, if used for any long periods. Same like the other chatting applications, IMO also provides the option to CHAT, with friends, relatives and near and dear one’s. While chatting, you can share the pics, videos or you can express your feelings using the fantastic inbuilt stickers in the IMO app. Here, we are not declaring that IMO chat is the best of all, we are just requesting you to use it for a TRY, and feel the difference yourself. 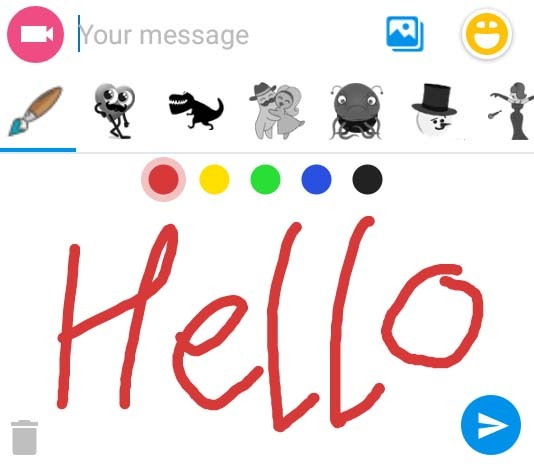 We know, you will love the appearance of the CHAT section and will surely convince others to use the IMO app, for this you can use the invite friends option of the IMO app. Don’t you think, everybody is getting bored using the same and same Stickers during the conversations. Here is a Good News, IMO people has thought about it, and came out with more than 150 categories of the unique stickers. We bet, once you went to their stickers gallery, you will only say, Oh My God, Fantastic collection. In addition to this, you can also manufacture your own stickers using basic drawing tools, don’t you think that’s cool. We think, IMO people has concentrated a lot on the STICKERS section, they know the craziness of people for the STICKERS. Below is the picture of a custom STICKER, we had made for you 🙂 . Unbelievable Quality of Video / Voice calls. Here comes the main one, IMO people has concentrated on the quality of the Video / Voice calls too. Actually, this is their major offering in the app, they don’t want to get behind especially in this. We have tried their service using 2G and 3G networks. While using their service in 2G networks, Video calling is good in compare to others and the Voice calling quality is excellent, they have left everybody behind if we talk about voice calling on the 2G networks. In the case of 3G networks, everything (Video & Voice calling) is super duper fast and above excellent. Technically, you always have to understand that the quality of the Video / Voice callings always depends on the network type you are using in your device / phone. 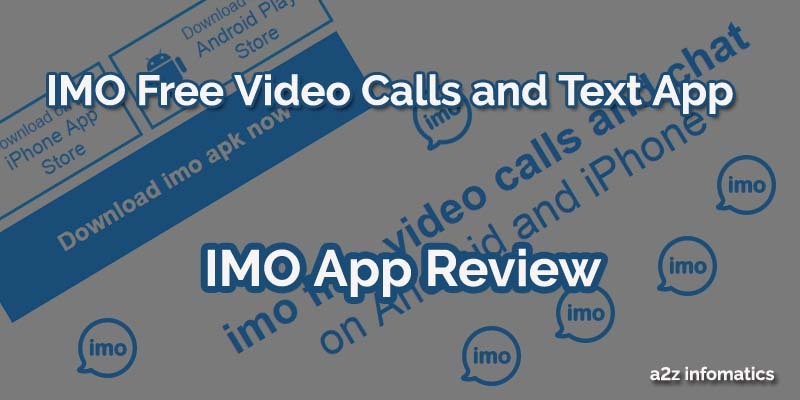 In simple words, we have noticed the best Video / Voice calling quality in the IMO app and will use their service in any of our future need, untill they drop down the quality 🙂 . Comes with the Group Chat option. Same like WhatsApp, You can create as many groups as you can. We hope, everybody is fully aware of this Group Chat feature due to the popularity of the WhatsApp 🙂 . Yes, you can share pics, videos with the members of the group. Actually, the inclusion of Video Chat inside the group will make this section of IMO different from the others. Who knows, if they are thinking to include the Video Conferencing option to their IMO Free Video Calls and Text App in upcoming days. By this we want to indicate the simplicity of the SETTINGS section inside the IMO app. Normally, everybody get confused with the custom settings. In IMO app you can change any of the account setting easily, or we can say, they have tailored this section in a well mannered way. 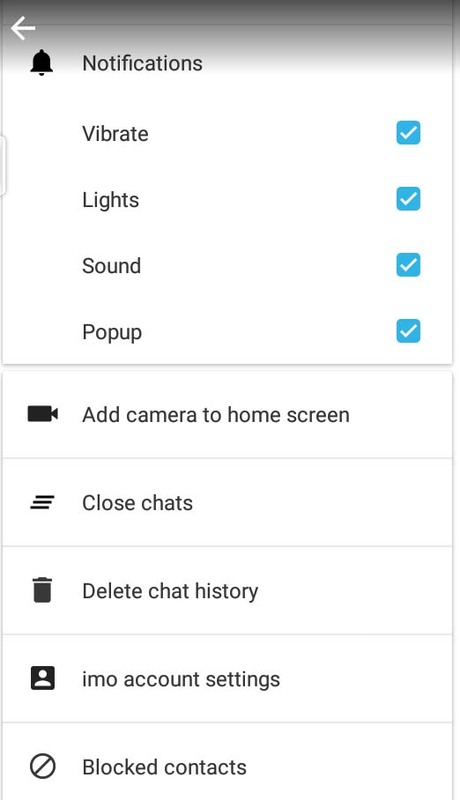 Options inside the setting panel are nearly same as all other apps are offering, you can delete chat history, block people, privacy section etc etc. Today, we have tried to convince you for downloading and using this GREAT IMO Free Video Calls and Text App. Here, we are not criticizing other apps of the same category, we love Skype, WhatsApp and Facebook. We just want you people to give it a try and share your experiences with the IMO app, under the comments section below, the same will be useful for the other people visiting this blog, to make any final verdict. That’s all we have about the IMO app. We will catch you again with some more informative stuff. Thanks for visiting a2z infomatics. God Bless Everybody.